CHICAGO — At roughly 10:48 p.m. CT on Friday night, a Syracuse fan with a front-row view of what transpired at the United Center effectively captured the moment. Juli Boeheim turned to her right, put both hands to her head, tugged a little bit on her hair and opened her mouth. Out came one long, high-pitched report—Aaaaaaaaaaaah!—and that was it. There were no actual words said, no standard vocabulary that could describe a 63–60 victory over Gonzaga and an Elite Eight berth in a season that once verged on disaster, in a tournament the team arguably shouldn’t have made. If you were looking for apologies here, you were out of luck, because apologies require more than one syllable. Nor would you find sheepishness or repentance in a locker room down the hall, where Juli Boeheim’s husband stood before his team, in full command of his speech faculties. Jim Boeheim slowly paced back and forth before his players with a box score in hand, hardly raising his voice. The Orange’s coach talked about being more patient the next time out. He talked about how great the win was, and how sick the players would be if they didn’t muster a better start in the Midwest regional final on Sunday. He talked about the toughness they showed in this comeback win over the Bulldogs, but he only got any kind of reaction when he said five words, repeating them for emphasis. That, the Syracuse players applauded. That has been the entire idea: to recoup, without guilt, what they felt they had been denied. They suffered through a scandal and the head coach’s resulting nine-game suspension this season. They endured the fusillade of barbs sent their way regarding their inclusion in the field of 68, ahead of teams that, say, hadn’t lost five of six games entering the NCAA tournament. There are of course valid arguments to be made that everyone brought this on themselves in one way or another. But when you refuse to accept that as a premise, as the Orange predictably have, then you have family-sized helpings of indignation to catalyze your every move. At midnight on Jan. 4, Boeheim was released from his suspension and held a meeting with his team at literally the first possible moment. Syracuse was barely hours removed from its third straight defeat to open ACC play, a 74–73 loss to Clemson at the Carrier Dome that dropped its overall record to 10–6. It’s unlikely that anyone believed at that instant that an Elite Eight run was possible, if only because they were more interested in figuring out how to win a league game. 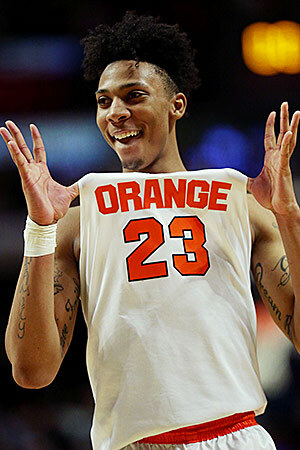 (“We weren’t really thinking that far ahead,” freshman forward Malachi Richardson said.) But the dynamics for the immediate future had been set. Whether it was a bit of lunacy or not, Syracuse’s only choice was to convince itself that it hadn’t already slipped off the face of the cliff, plunging to its demise. It had to trick itself into believing it was still mid-climb, and every perceived slight or affront became a nice foothold. So, fittingly, fully equipped with pique, blind faith and the savvy to make a couple adjustments, the Orange scraped their way into the Elite Eight and a matchup with No. 1 Virginia. Early on, Gonzaga’s Kyle Wiltjer stood just outside what would be considered the logical range of Syracuse’s standard zone defense and thought about passing or putting the ball to the deck. He launched a three-pointer instead and drained it, one of the first daggers as the Bulldogs pulled ahead by 11 midway through the first half. Before the next defensive possession, Boeheim got senior guard Trevor Cooney’s attention to inquire about his theory behind giving Wiltjer, a 43% three-point shooter, that much room. That seemed a fallacy, too, when Gonzaga hit eight straight second-half shots to build a nine-point lead. But Syracuse went to a full-court press to recreate some disruption—“We always play man-to-man in practice and we always press,” Hopkins said. “It’s always a weapon”—and the meltdown from the Bulldogs ensued. Gonzaga scored its last basket with six and a half minutes remaining. And the decisive sequences, all owned by the Orange, were nothing if not borne from the orneriness that defined this season. Michael Gbinije’s go-ahead basket with 22 seconds left came off an offensive rebound of his own miss, deflected to him by teammate Tyler Roberson. Cooney appeared to make a game-sealing steal on Gonzaga’s ensuing possession—“That’s a rotation we work on every day in practice,” the senior guard said—only to have officials rule that he stepped out of bounds when his foot appeared, on replays, a good inch shy of the line. The official review that followed couldn’t even address that mistake by rule—referees can only go to the monitor to determine possession if a ball trickles across the line, and Cooney clearly had possession—so it suddenly threatened to become the ultimate injustice for a team that believes it encountered injustice around every dang corner. “That would have been a tough way to lose,” Boeheim said. It would have been a tough way to lose a game in the way an asteroid crashing into your car is a tough way to lose your ride to work. Instead, the 6'9" Lydon stepped in front of a Josh Perkins drive and swatted away a floater from the Gonzaga guard, collecting his own block and hitting two free throws with 1.6 seconds left to seal it. “We made the defensive play again,” Cooney said. If it is unfathomable that Syracuse is here, it is hard to imagine this team taking any other path. It caught a break with No. 2 Michigan State’s equally incredible first-round loss to Middle Tennessee, absolutely, but the rest has been all potholes and detours. Boeheim’s suspension, the grief over the spot in the NCAA tournament to begin with, the multiple foreboding deficits to Gonzaga, the officiating blunder that might have been: pile it all up, and pile it high, and Syracuse just claws and gnashes its way through somehow. And there may actually be no explanation for it. Asked to describe the feeling of this, of going from NCAA enforcement crosshairs to NCAA tournament bubble to one win from the Final Four, Gbinije smiled, pondered and then surrendered. Fortunately for us all, the Syracuse basketball head coach is not as regularly tongue-tied in the moment as his wife or his players. In the locker room after the game, as he talked about patience and toughness and taking the night from a Gonzaga team that had just about seized it completely, Boeheim was also looking ahead. He talked about Virginia, and the one hill that everyone else surely will think is too high to climb. “There’s nobody we can’t beat,” Boeheim assured everyone in the room, though he’d probably be happy if you suggested otherwise.